Last week at work was pretty bad. I was having a very hard time finding the sunny side of anything. I am usually good at “going with the flow,” but the flow turned into a torrent and by Friday night, it felt as if I’d been swept over the falls and put through the wash and spin cycle at the bottom. 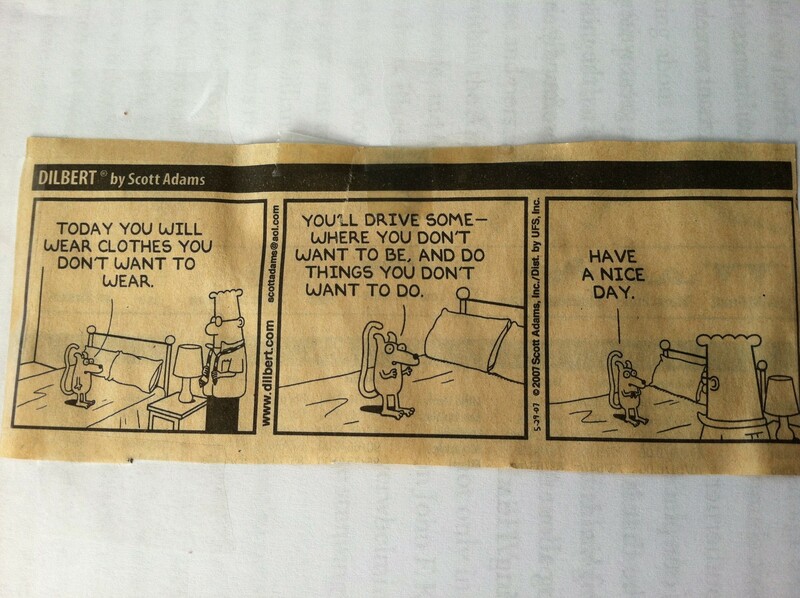 Saturday morning, trying to resurface, I was piddling with notes and mail that had accumulated from the week and came across one of my favorite Dilbert cartoon strips. As you can see from the color of the news print, I’ve had this awhile. Finally, my ray of sunshine! I enjoy reading Dilbert, even though I can’t say I always “get it,” but the connections between that workplace and mine are frighteningly close at times. Thank goodness for humor to help get us through life. Saturday evening about 7:30 or so it started to rain. The temperature dropped about 15 degrees and we sat outside on the covered patio, watching and listening to the rain, just enjoying being outside. It was a nice way to bring the day and the week to a close.